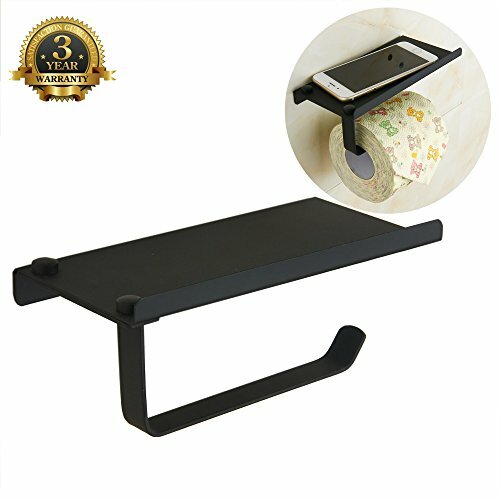 A stylish open-arm toilet paper holder with storage shelf for phones, soap glasses and other stuffs. Sturdy construction that keep your tissue well and fit small bathroom well. This MARMOLUX ACC toilet paper holder with mobile phone shelf is more than a simple tissue holder. Not only can it hold small to large toilet paper rolls, it has top shelf for you to store items! You can place your bag, phone, keys, watch, and other personal gadgets on it and within arm's reach without worrying about them falling off. This tissue holder also has all the bolts and screws necessary to easily fix it onto the wall of your toilet or bathroom, either at home or your office¡¯s work space. The 304 stainless steel material is durable, rustproof, and resists scratch, wear, or tear for a lifetime usage! What are you waiting for? Click ADD TO CART Button on the Top Right Side to Get Yours Now! A GREAT PLATFORM for holding mobile phone, wipes, hand sanitizer, soap,key, ashtray, watch, glasses and other small stuffs, it make convenience for you when you spent your time in bathroom. MODERN DESIGN with top holder part, perfect place for cellphone, even good for friends who conducts "business" while in the bathroom.Now you have a place to put your phone so it doesn't fall down into the sink or on the floor ! PERFECT PURCHASE FOR YOUR BATHROOM sturdy construction, easy to install, and best of all, it keeps your pets from dragging and shredding toilet paper all over your house! GOOD FOR SMALL SPACE if your tissue holder is right next to the sink, it very easy to make your tissue wet. With this holder, your problem will be gone, it hold large tissue tightly, while the platform keep your paper from wetting. LONG LIFE SERVICE made from solid stainless steel, high quality satin matte black coating, soft metal feeling, and won¡¯t be out of style, waterproof, rustproof, and anti-corrosion, really worth money. If you have any questions about this product by Marmolux Acc, contact us by completing and submitting the form below. If you are looking for a specif part number, please include it with your message.